MINNEAPOLIS (AP) — Josh Allen played with the poise of a well-seasoned quarterback, hustling to give Buffalo an early lead in his first NFL road start. Then, the Bills turned their defense loose on Kirk Cousins and delivered a stunningly lopsided victory over the Minnesota Vikings. 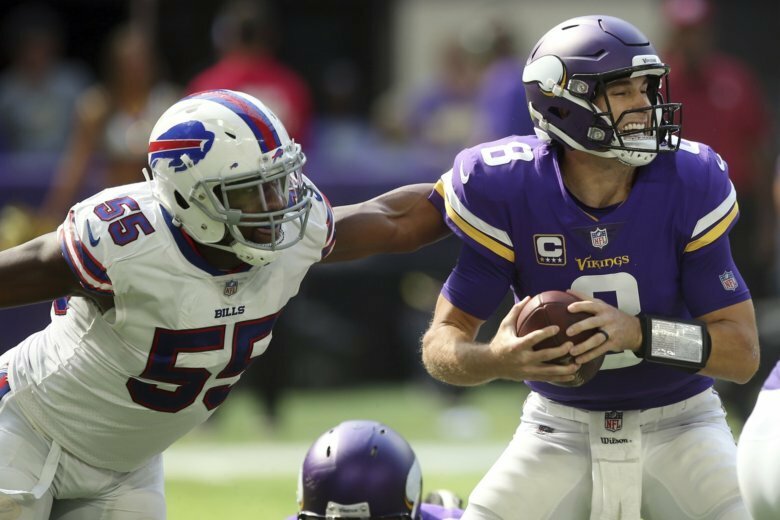 Allen accounted for three touchdowns, making Cousins look like the raw rookie as the Bills beat the Vikings 27-6 on Sunday as 16½-point underdogs. Cousins had three turnovers. He lost a fumble on a third-down sack inside Minnesota’s 20-yard line on each of the first two possessions , and Buffalo turned those recoveries into 10 points. The Bills built a 27-0 lead by midway through the second quarter as the crowd at U.S. Bank Stadium, where the Vikings had won 10 of their last 11 games including the playoffs, began booing with increased intensity. The Vikings (1-1-1) allowed the Bills (1-2) to become only the sixth 16-plus-point underdog winner in the NFL’s last 81 point spreads of that size. According to ESPN research, the last such winner was Washington over Dallas on Dec. 3, 1995. After being outscored 75-9 over their first six quarters of the season, the Bills have enjoyed a 41-9 advantage over the last six periods. Allen certainly earned some with this performance. The seventh overall pick in the draft out of Wyoming who took the job earlier than expected in relief of a struggling Nathan Peterman in the opener, completed 15 of 22 passes for 196 yards. That included a 26-yard touchdown pass to wide-open tight end Jason Croom . Though Allen took three sacks and fumbled three times, the Bills were able to recover all of them. He put together a mini-highlight film with his feet while injured running back LeSean McCoy watched in a sweatsuit — with a big smile — from the sideline. Allen dived to finish a 10-yard run by beating Anthony Barr to the pylon to finish the game’s first drive. Later, on third-and-9, Allen hurdled over Barr to land past the first-down marker. He capped that possession with a 1-yard touchdown leap over the goal line on fourth down for a 24-0 lead early in the second quarter. With running back Dalvin Cook (hamstring) inactive and the score so lopsided, the Vikings set a franchise record for fewest rushing attempts with six. Cousins, who took four sacks, finished 40 for 55 for 296 yards and a late touchdown to Kyle Rudolph . The Vikings inducted the late Dennis Green, who’s second behind Bud Grant in winning percentage as a head coach, into their Ring of Honor. Green, who guided the Vikings to the playoffs in eight of his 10 seasons, became the 24th member. The Vikings beat the Bills in all three meetings under Green. Bills: Beyond McCoy (rib), starting CB Phillip Gaines (elbow) and backup DE Shaq Lawson (hamstring) was inactive. … Russell Bodine, who started at C for Ryan Groy, left with leg cramps in the third quarter. Groy, who had moved to LG when Vlad Ducasse was injured, shifted back to the middle as Ducasse re-entered. … CB Ryan Lewis, making his NFL debut in place of Gaines, left with an injury in the fourth quarter. Murphy (ankle) did, too. Vikings: In addition to Cook and DE Everson Griffen (knee), backup TE David Morgan (knee) and PR Marcus Sherels (ribs) were held out. Griffen was not at the game, and Zimmer said he was dealing with a “personal matter.” … CB Trae Waynes (ankle) left in the first quarter and didn’t return. … RT Rashod Hill (ankle) departed in the second quarter and didn’t return. Bills: Play at Green Bay next Sunday. Vikings: Play the Rams in Los Angeles on Thursday night.